Write two facts you learned about Henry “Box” Brown. Who started the Montgomery Bus Boycott? Why did Harriet Tubman carry a gun? Teaching first grade is a balancing act of teaching students how to write (see legibility) while also teaching them how to write about content–about the various science and social studies themes that we study throughout the course of the year. Now in my fourth year of teaching, I have started to rely more on the notion of “writing to learn” to help with this. The exit questions listed above showcase just how one-dimensional I was making my students’ learning of history-altering individuals and events prior to fully implementing the strategy within other disciplines in my classroom. Specifically, my students did not need to have a deep understanding of any one person or event–they could quickly recall facts and not need to make any inferences or suppositions that they could relate to their own lives. Knowing that my students gained only a surface-level understanding of the content and that they were doing little writing in these content areas left me feeling defeated and on the lookout for something more. The concept of writing to learn is one in which I have slowly gained a better understanding; for years, that writing requirement on my state’s teacher assessment portfolio list has taunted me. Through completing more of my own research through one of my graduate level courses this year, however, I finally felt like I was ready to implement the illusive “writing to learn” in my own teaching. Writing to learn, as opposed to learning to write, is explicitly teaching writing while also using the process of writing to have students learn about the content. Both facets are critical to the success of writing to learn. It was a happy coincidence that a graduate assignment had me implementing a writing assignment with my students, analyzing their performance against mastery level of the Common Core State Standards, and then creating a rooted-in-research next-step plan for reteaching the concept to my students. As a part of my district’s curriculum map, my first grade students are required to learn about historical perspectives – who are some key individuals we study? Why do we remember them? 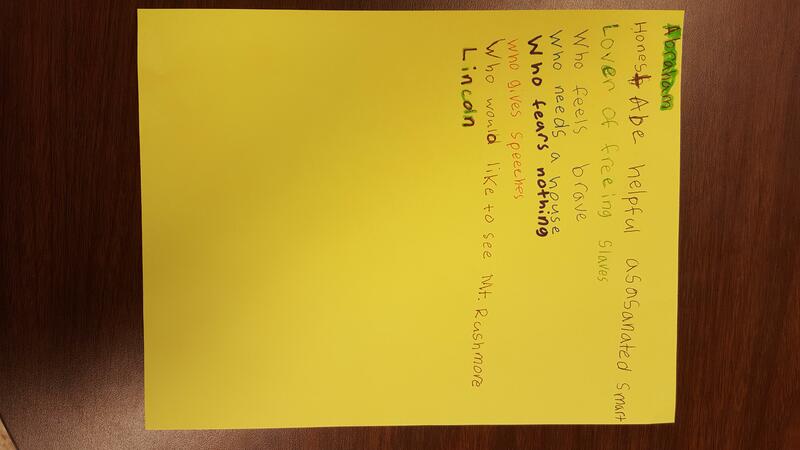 What are some character traits that important figures from our past have? To start our unit on key historical figures, I first chose some specific individuals to study during the unit, guided by the character traits that they possessed and how they are remembered today. My objective was to ensure that students could recall information as it relates to our historical perspective, but also that they could apply their knowledge of facts to create inferences about why these figures are important. I decided to apply my own understanding of writing to learn to my students’ learning of historical figures by creating a miniseries of biopoems for the last few figures that we were going to study explicitly. 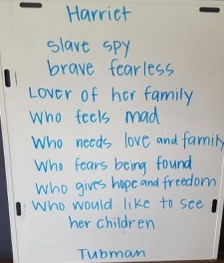 Facing History has a great outline to use with students in the creation of their own biopoem, but for my little learners I composed my own outline highlighting aspects of the individuals we were learning about. While applying creative writing in social studies has been used with writers of all ages, I was apprehensive about the confusion it might create with my young writers. Would my students be able to provide me with more information than they had read? Would my students feel the ability to be creative? Would they make and include inferences about people they did not know? Could they think beyond themselves? My learners need lots of modeling, exposure to examples and time to be scaffolded to create projects on their own, and I wanted to provide the time necessary for them to do so. My students were halfway through their unit when I realized I could implement the use of biopoems into my room, even with learners as little as mine. I knew that my students would need opportunities to be scaffolded through the process before I “let them loose.” We needed to be able to recall information we had learned, to think about what it meant, to begin to write poetry, and to put our learning into the poem. We reread a passage about Rosa Parks, watched a Brainpop Jr. video about her, and brainstormed some of her accomplishments and life events over the course of one lesson. In a whole group setting we then composed a biopoem about Rosa. 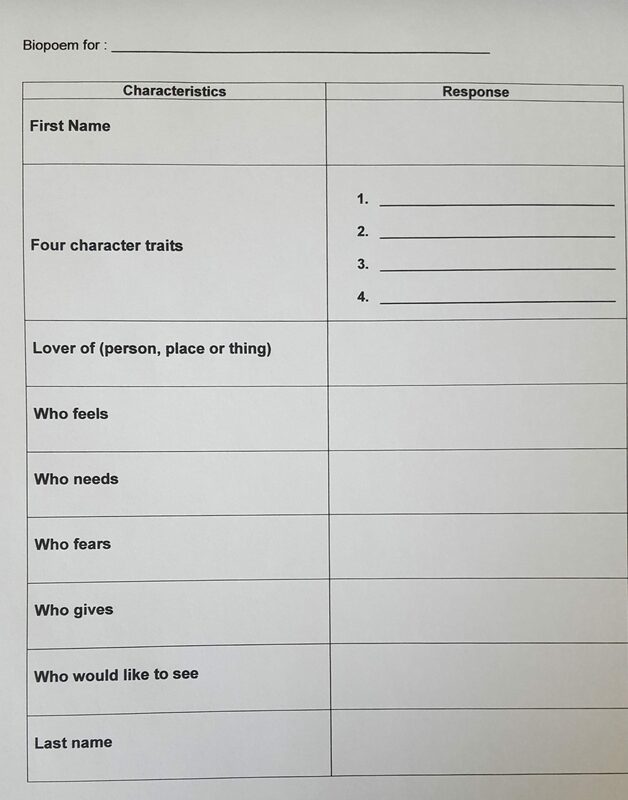 Although I was incredibly pleased with our first attempt, I knew that our next attempt would be even better with more scaffolding, the use of the outline, and text-based discussions about the character traits of the historical figures. My students piggy-backed their ideas off of one another which led to some repetition within our Rosa Parks poem, but I implemented a method of discussion when we began writing about Harriet. We reread stories we had used to explore her life and watched another Brainpop Jr. video to build parallels. Then, I posed questions and required them to defend their thinking in their answers. What or who did she love? How do you think she felt? Explain why you think she felt that way. What is something you think she needed? Why? What was she afraid of? How do you know? What is a gift that Harriet gave to others? What do you think Harriet wanted to see? I required them to justify their thinking to me verbally before we wrote anything down, and I found that they could back up exactly what they were saying. The process of writing about the content helped both me and my students. It prompted me to craft questions that got to a deeper level of understanding about Harriet Tubman and the other figures, and it helped my students consider the importance of the facts presented more critically as they synthesized and evaluated during the writing process. They frequently referred to Moses: When Harriet Tubman Led Her People to Freedom by Carole Boston Weatherford and Harriet Tubman by Wil Mara to justify their claims about Harriet’s feelings and actions. When it came time to compose our class poem, we had to think about which pieces of information we wanted to include and agree on them as a whole. We ended up with so many good ideas that we included a couple of details about Harriet on a few of the lines within the poem. In an effort to continue to scaffold my students’ learning, I allowed them to work with a partner to create a biopoem for Abraham Lincoln. At first I was a bit skeptical about the work they would produce – considering I had done a lot of coaching and acting as a guide for them to examine aspects that were necessary to mention about the people we were studying. However, I was surprised when I received poems that truly did Lincoln justice. 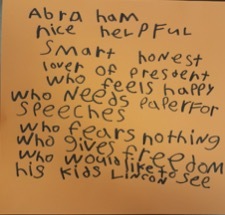 Throughout the writing process, my students were able to recall information they learned about his contributions and his life from our various texts, and they produced poems that used words and phrases to capture the essence of who Lincoln was. My students enjoyed having their own ideas that they could share with a friend, deciding which response was essential to include and ultimately, sharing their creations with their peers. Reading their poems gave me so much more information about what my students understood about Lincoln and how he impacted our nation. The genuine discussion, the defense of facts and my students’ increased engagement over the course of the unit was all I needed to see to know I am on the correct path with utilizing writing to learn in my classroom. So much of my teaching littles requires a lot of front-loading information, procedures, strategies and routines. Many primary teachers feel overwhelmed by the amount of time it will take our younger learners to begin to master a new process for completing a task. While I admit that this process was time-consuming, especially in the beginning, I also admit that it was incredibly rewarding for me. I got to see the breadth of my students’ learning, and it continues to inform my instruction in the future. My only hopes at this point are to continue to find ways to incorporate creative writing to learn opportunities within my own classroom, and to share the ideas with my colleagues so that they may consider implementing the same in their classrooms. The end goal for me is to have my students engaged in deeper learning and to foster their understanding enough so that they are able to learn more deeply. Goodbye to superficial exit tickets, and hello to creative, student-centered writing to learn across content areas! Contea Fisher is a first grade teacher in the Jefferson County Public Schools district in Kentucky. She graduated from the University of Louisville and received her Master’s of Education in Teacher Leadership. She has been teaching for four years. Eileen Shanahan is an Assistant Professor of Literacy Education and Coordinator of the Literacy MAEd program at Eastern Kentucky University. She previously taught eighth grade language arts in Charlotte, NC, where she also served as a middle school curriculum coordinator.